Full Remission! "Three Months Ago, I Was Given Three Months to Live." - BLIND FAITH LIVE! - Miracle MomentBLIND FAITH LIVE ! Real People. Real Miracles. Steve Johnson is still very much with us. 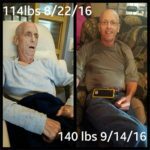 Steve, hit hard by cancer, had dwindled to 114 pounds. His doctors had given him the death sentence. Steve sent his picture to be prayed over by Dr. Nemeh, as well as utilizing an appointment over Skype and an in office medical visit. The end result was that Steve Johnson, after three months, was in full remission, instead of dying. This entry was posted in Dr. Issam Nemeh, Miracle Moments, Miracle Prayer, Philip Keller, Trapper Jack and tagged Cancer, Faith by Philip Keller. Bookmark the permalink.